I remember watching Kevin Kelly in the AWA in the late 1980's. He was a tall, muscular wrestler with long, golden locks. He seemed like the exact fit for Vince McMahon and the WWF. When Kelly did sign with the company though, he had a much different look. His long hair was cut short and was much thinner than it was during his AWA run. He no longer wore his typical wrestling gear. Instead, he was Nailz, wearing an orange prison jumpsuit with the number 902714 on the back. 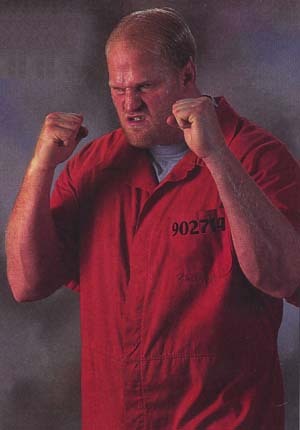 Kelly's gimmick was that of a bitter inmate from Cobb County, Georgia. He was in the WWF to get revenge on the prison guard who beat him while he was incarcerated. That guard was the Big Bossman. Nailz attacked Bossman at a Superstars taping in 1992. After handcuffing the baby face law enforcer to the rope, Nailz preceded to beat Bossman with the very nightstick he brought to the ring. It was more like a mugging. The attack was brutal and left the Bossman on the shelf for quite some time mending. As Bossman recovered at home, Nailz went on a bender, beating the tar out of jobbers each week. Finally, at Survivor Series 92 Bossman would get a chance at redemption. He and Nailz met in a "nightstick on a pole" match. I think that may have been the one and only time such a match happened in the WWE. Of course good prevailed over evil and the Bossman won, giving Nailz his much deserved comeuppance. After that, Nailz sort of fell into an oblivion. I think he had a brief feud with the Undertaker, which the deadman prevailed as well. Then I've read reports that he actually roughed up Vince McMahon over a contract dispute and was fired as a result. Not a wise decision. Nailz reemerged as "the Prisoner" in WCW for a brief stint (another creative round of thinking by the folks at Turner).